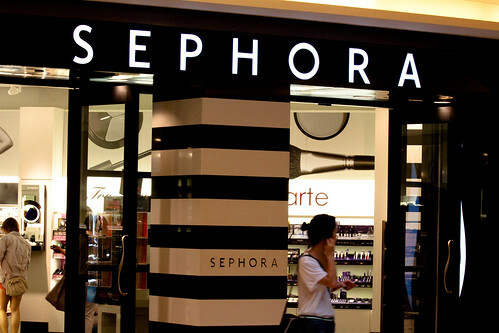 New Sephora, originally uploaded by Elsbro. The long-awaited Sephora launch in downtown Vancouver brought a few good things to the city: in anticipation for the arrival of a new competitor, Holt Renfrew added Holtscents – an expanded fragrance division with many niche brands, including Editions de Parfums, Miller Harris, Bon No. 9, Juliette Has A Gun, Miller et Bertaux, Ineke, and several others. Some vanished after a while due to lack of demand (By Killian and Etat Libre d’Orange) but we can only hope the others will stick around and keep our dull Vancouver life interesting. Shoppers Drug Mart took a similar approach and expanded their fragrance and cosmetics tremendously – carrying brands that used to be only found in luxe department stores – Prada, Guerlain, Clinique, BeneFit Cosmetics, Comptoir Sud Pacifique and others. around 2pm on a Friday, taking a detour on the way to pick up printed labeling for the Tropical Flower & Spice Limited Editions for the tea party that weekend. It was a very hot day and I sought refuge in the mall’s lavishly air-conditioned space. The first thing that crossed my mind was: don’t anyone have a job anymore? Because clearly, everyone and their two girlfriends seemed to be at Sephora trying out new makeup. The downside was that the store was packed to say the least ( but that was nothing comparing to the opening day which I promptly skipped, being the crowd-avoider expert that I am). Apparently 7,452 is not enough to host all of Vancouver’s beauty junkies. The up side, of course, was that I was able to roam freely in the shop without anyone offering to “help” and asking me boring questions about my fragrance preferences. I scouted everything that is new and unusual and can’t be found anywhere else in the city, and as far as fragrance goes I was not quite blown away. There was the Tweety bird perfume, with a promptly yellow atomizer bulb that turns the otherwise classy vintage-style perfume spritzing into a deja-vu squawking a rubber-duck in the bath-tub when you had to babysit your little siblings (by which point, commenting about the scent seems futile). On the other hand – I spotted some rather fantastic size for Fracas – a 7.5ml roll-on which if only for the long line ups would have landed in my purse later that afternoon. Scent-wise, my sniffer was impressed with several things: Cannabis Santal – a strange mélange of woods, patchouli and chocolate that is not in the least as doobie as the name implies; rather, it reminded me of a cross between an Hermes masculine (Either Vetiver Tonka, Poivre Samarkand or Terre d’Hermes) with an overdoes of chocolate. I also found Cannabis Rose, which I had to try because one of my classmates in Grasse raved about it and it was created by a young perfumer at Robertet. Cannabis Rose smelled like the new generation of Chypre – with patchouli, vetiver and musk as the base and a warm and clean rose heart – but not quite spicy or rosy. I tried the body cream of that and it was overbearing though and will have to try it on skin at a later time. As an aside - Fresh can be found both at Holt Renfrew and Beautymark but neither of them carry the entire line, and neither of these two scents, to the best of my knowledge. And last but not least – it was a very nice surprise to find Demeter Vintage Naturals 2009 limited edition collection of 5 soliflores that are all-naturals: Lavender, Rosebush, Patchouli, Geranium and Mimosa. The latter captured my attention immediately. Geranium has been my obsession in the past year or so, and it was refreshing to see it treated as the main theme. This geranium is extremely leafy and fresh. It starts herbaceous and minty and dries down into a more earthy base, and geranium is always at the forefront – no surprises there. Mimosa opens with a dominant mimosa absolute note, which is a top note so it does not stick around for too long. Than it morphs into a complex, rich white florals – with ylang ylang, jasmine and powdery tonka bean whispering sweet nothings in your ears till you are completely seduced. It has an incredible lasting power. I am yet to try the other three but so far I have to say I’m very impressed with this mass-produced natural perfume, and the price is very reasonable at $75 a pop (50ml EDP spray). And the other evening, I stepped in again, and although the store was not as busy as before, the lineups were intimidating. For the first time I got noticed by a sales rep which I gently refused. Fortunately, I had Tamya with me so I got to try the Geranium and the Mimosa again and also tried Fresh’s “Strawberry” (so not!) on Tamya’s one wrist, and BeneFit’s whimsically martini-shaker packaged “Something About Sofia” from their new Crescent Row collection (lilies and some fresh tart fruit – perhaps apple and lychee?) on the other. Incidentally, "Something About Sofia" was what was suggested to me after completing BeneFit's quiz. Also, if they had a quiz to find out how much of a sucker for a cute bottle you are I would probably lead with at least 99% and buy the bottle on the spot. As it turned out, I was impressed by neither but I learned a new shopping tip: take your kids with you and use them as living scent strips. It would save you money.